Koh Phi Phi is one of the most talked about places in Southeast Asia for its limestone cliffs, turquoise waters, white sand beaches, and miles of forest. While there are still many day trippers to Phi Phi Islands, some people think they can’t get enough of this tropical paradise and end up staying here for a longer period. If you also decided to stay here for a few nights in Phi Phi Don, be sure to check our comprehensive travel guide and find out the must-see destinations and best places to eat, party, and sleep in Phi Phi Don! 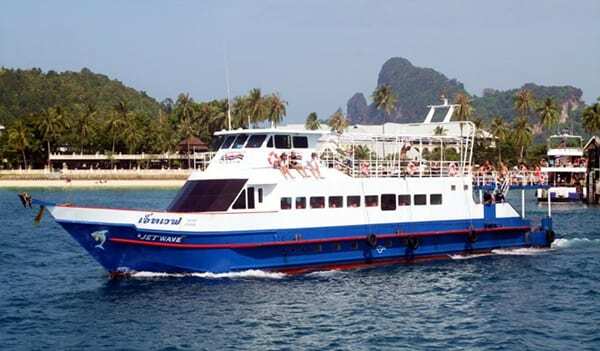 There are ferries from both Phuket and Krabi every day, but the timetable of the ferries varies depending on the season. The ferry ride is roughly 2 hours long from Phuket, and 1 hour long from Krabi. The boats have air-conditioned areas with comfortable seats. There are also decks outside from where you can savor the view of the clear blue waters. Once you get to Phi Phi Don, you’ll have to pay a 20 baht of environmental tax fee, which helps to keep the island clean. There are no roads or cars on the island, thus once you reach, you’ll have to drag your luggage to your accommodation. However, there are many men with carts at the dock area, so you can pay them and get them to transport your luggage. When you look at the Phi Phi Don from its viewpoint, you can see a long flat sandy strip that connects the east and west of the island, creating the double bays of Ton Sai and Loh Dalam. One side of this scallop is Ton Sai Bay, where the main pier is and where the most boats are coming in. You can imagine how busy this beach is considering all the food and hotel supplies that must be shipped in. However, there are some nice restaurants here, and it is still pretty. Between the 2 beaches, the busy Ton Sai Village is located, where most of the hostels and cheap accommodations are, along with tons of shops and bars. If you walk through the alleyways, you will find the Loh Dalam Beach, where the island’s main party scene is. Ton Sai Village is an ideal base for touring the area as it is brimful of guesthouses, hotels, bars, restaurants, travel agents, ATMs, mini-marts and many stalls. 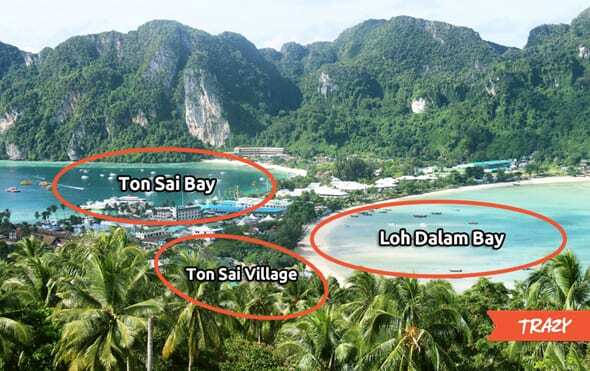 In fact, the majority of travelers staying in Phi Phi Don are based in Ton Sai Village. Thus, you will likely meet some other travelers who are willing to share some tips on nice places to go or good places to eat or drink. The best part about staying in Phi Phi Don is that whether you have any tour plan or not, you can still have an incredible day. One of the best things to do in Phi Phi Don is to just chill by the ocean. After all, you are already on the tropical island, you don’t need to go far to find the beautiful beaches. Loh Dalam Beach is probably the prettiest beach near Ton Sai Village, and if you go a little further to the west, there’s the famous Monkey Beach, where you can find cute monkeys. These monkeys are very friendly and familiar with human as this beach is always crowded with the global tourists. Monkey Beach can be reached on foot, by renting a canoe, or by chartering a longtail boat from Loh Dalam Beach. The view of the island from the viewpoint is simply mesmerizing. The hike takes about 20~30 mins, and it is pretty easy and manageable even in flip-flops. The best time to go for a perfect photography is before 10 AM as the sun will be behind you which brings out the color of the sea. Or you can visit just before sunset to catch the gorgeous sunset view. 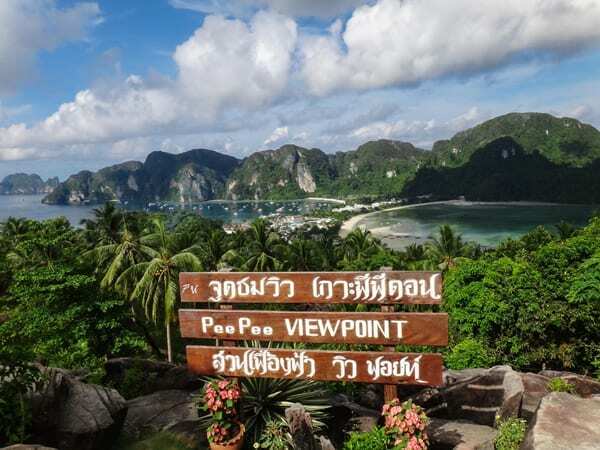 If hiking up to the viewpoint is not enough for you, hit the trail even deeper and explore Phi Phi Don’s jungle! There are countless hidden gems in Phi Phi Don which are hard to find on your own. You can simply just sign up for a trekking tour and discover every nook and corner of Phi Phi Don. Here’s the best Phi Phi Don trekking tour by a top-rated trekking tour company. Phi Phi Leh, which is located to the south of Phi Phi Don, is an uninhabited island meaning it’s only accessible by day trips. One of the biggest perks of taking a day tour from Phi Phi Don is that there is no rush for returning as it doesn’t take a long time. Plus, you can catch the beautiful sunset owing to the fact that your boat will be one of the last leaving the bay. When visiting Phi Phi Leh, the touring course would have been to stop at Maya Bay, one of Phi Phi Leh’s hottest tourist attractions. But recently, Thai authorities have closed down Maya Bay indefinitely, in attempts to rehabilitate the island’s marine ecosystem after the coral reefs of the island began to die out due to overtourism. You’ll still be able to get a good view of the beach from afar, as well as go swimming and snorkeling. However, the boat will only stop in front of the bay as visitors are not allowed to enter the beach anymore. With this cruise tour, you will get unlimited alcohol drinks before & after the cruise ride. Also, you can enjoy a longer time at each destination, lunch, BBQ dinner, and after-party with the stunning sunset! This will be a perfect cruise tour for those who want to have a party-filled day in Phi Phi Islands. Along with the full moon party on Koh Phangan, Phi Phi Island, is one of the most popular party islands in Southeast Asia. Loh Dalam Beach is the ultimate party beach on Phi Phi Don. Once the sun sets on the island, the volume gets turned up, and the main area of the island becomes a party ground playing live music and fire shows. Follow the crowds down to the beach and get involved with the music. You will also find many alcohol buckets which are great for sharing. Fire shows happen nightly and it’s really impressive most of the time. Most of the restaurants in Phi Phi Don are located in Ton Sai village. You will actually get spoiled by plenty of dining options. Here are some of the best places that have great reviews from many people. The Mango Garden is a dessert café specialized in Mango menu as its name suggests. The must-try menu here is sticky rice & mango. This place is clean, and the staff is very kind. They also have the free wifi. Phi Phi Bakery has all kinds of breakfast food such as pancakes and eggs benedict as well as the bakery menu. It’s a perfect place for those who love cozy style café, and they have one of the best coffee in Phi Phi Don. Their food has a huge portion but not that pricey. Make sure to get there early because their food tends to sell out fast. Aroy Kaffeine is a cute little restaurant offering healthy and authentic Thai dishes. Every menu is cooked fresh upon the order. People say they have the best green curry in the area. 😋 They also have free WIFI. Reggae Bar is a bar with a boxing stadium. You must buy a drink (the price is standard) to watch the boxing matches. Anyone can volunteer for a fight against local fighters and other tourists and get a free beer as a prize. There is no entry fee for this place. It’s not just Phi Phi Don you should visit in Thailand, because Thailand is scattered with many more beautiful islands! Search for other islands in Trazy’s brand new Thai Island Paradise page! 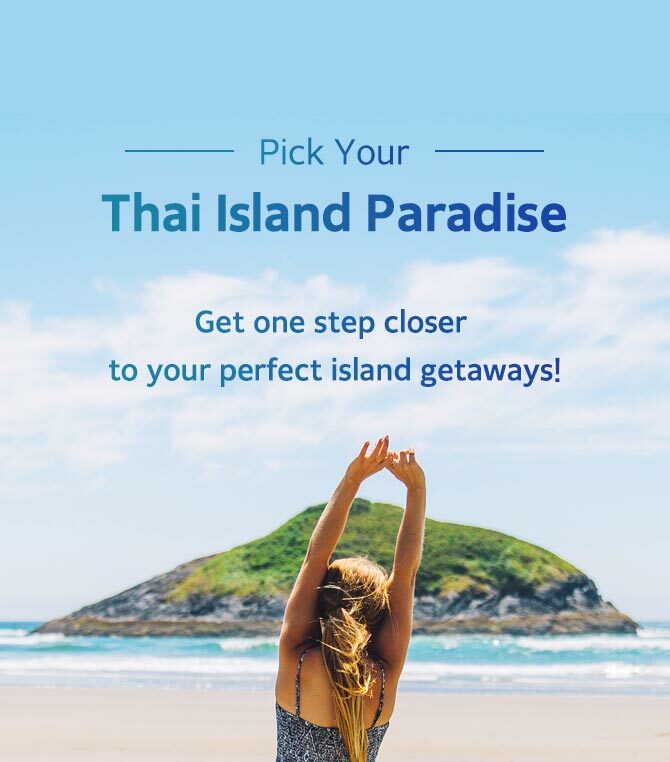 This’ll help you learn a little bit about the islands around Thailand, and eventually help you decide where you want to go for an island getaway! You can search for the island tours from three different areas; Phuket/ Krabi, Pattaya, and Koh Samui/ Koh Phangan. If you have any further questions, please feel free to ask or comment in the comments section! Last but not least, don’t forget to visit Trazy.com for more travel tips and ideas for your next trip to Thailand!